Since 1980, the Data Image Group has provided state of the art document and data conversion services . Our area of expertise includes document and information management, document storage, retrieval and distribution, records management and document destruction. Our image capture facility is staffed with experienced highly skilled technicians. Our clients include government, manufacturing, education, hospitals, banks, utilities and the legal industry. We provide the following out-sourcing services to the Mid-Atlantic region. Replace paper files in your office with perfectly organized, instantly accessible electronic images. 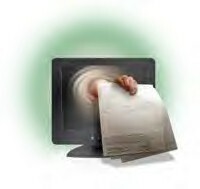 We can create digital images from most any type paper document from check size to computer output. After data entry or OCR processing, your documents can be uploaded in to PaperVision retrieval software or we have the ability to output to most major electronic management systems. We can provide digital images for upload into most existing electronic document management sytems or the standard group4 tif format. Microfilm formats that can be scanned include 16mm or 35mm roll film, jackets or aperture cards. Our image capture facility offers scanning and indexing solutions for large format engineering and architectural drawings up to 50" wide. Our Contex large format scanners provides superior scanning quality for all your as-built and legacy documents and drawings.Scanned images can be converted to most any file format, including tif, pdf, group4 and CAD compatible at whatever dpi is necessary. Microfilm remains a low cost, effecient way to store paper documents for long term archival. From checks to engineering drawings, we can provide 16mm and 35mm microfilm in either microfiche jacket, roll, or aperture card format. Computer Output Microfiche (COM) remains the most cost effective way of archiving, mass duplicating and distributing computer generated reports. COM can be produced from most any media including magnetic tape, DAT tape, and CD-ROM or direct transmission, FTP or attachment to an e-mail.